Grave Mercy is an example of why I love reviewing books. For the past few years, I've tried to broaden the genres I read, which opened me up to this historical fiction set in Brittany in the 1400s. Ismae is rescued from an abusive arranged marriage and taken in to a convent of nuns who have been sired by Death. (See how far I've come? I just used the word "sired"!) Trained as assassins, the nuns are sent into the world to kill people who wear Death's marques--a black smudge that shows how they are supposed to die. 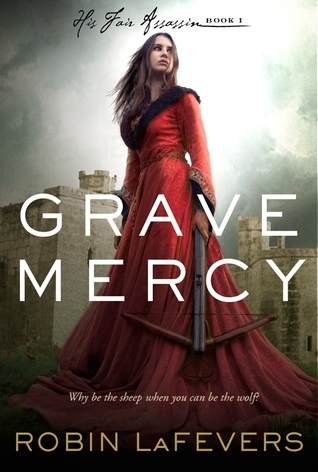 Ismae is placed in the court of Duchess Anne under the guise of being her half-brother's cousin (read: mistress), charged with protecting Anne from the many who would betray her for the throne. The development of Ismae's relationship with Gavriel Duval is expected, yet enjoyable. We know that their mutual scorn is going to turn into love, but it feels organic and eventually we are rooting for them to get together. My favorite thing about Ismae and Duval is that they speak plainly to each other. When they have suspicions or learn something about the other, instead of fretting over it for several chapters as would happen in most novels, they confront the issue and work through it. There is also dark humor threaded through the book. Ismae says, "'I do not care for needlework.' I pause. 'Unless it involves the base of the skull.'" These jokes are welcome among all the court intrigue, which had me genuinely wondering who were the traitors. Author Robin LaFevers kept the novel fairly historically accurate; a history of the time period is available on her website. I read that the second novel in the series will focus on another assassin, Sybella, who briefly appears several times, memorably asking, "Is there a poison that will make a man's member shrivel and fall off?" This is a character I want to know more about!